This month, the government released draft legislation regarding the proposed changes to plant and equipment depreciation as announced in the May federal budget. The draft outlined further details around a property investor’s eligibility to claim depreciation and provided a range of scenarios to be aware of should this legislation pass. In a positive move, the government has provided the public with an opportunity to have their say on the new measures, with public consultation open until the 10th of August 2017. While these measures are yet to be legislated, we have taken a proactive approach in reviewing how these intended changes could impact investors. Following is an in-depth look at the possible outcomes. Section two of Treasury Laws Amendment (Housing Tax Integrity) Bill 2017 advises that the Bill intends to amend the Income Tax Assessment Act 1997 (ITAA 1997) to limit deductions for plant and equipment in residential premises. In essence, the proposed new law reduces the amount an investor can deduct for a previously used depreciating asset for the purpose of gaining or producing assessable income. Should the proposed legislation be passed, this means that residential property investors won’t be able to claim depreciation for plant and equipment assets found in second-hand properties in which contracts exchanged after 7:30pm on the 9th of May 2017. The draft legislation outlines some detail around a reduced Capital Gains Tax (CGT) liability for property investors. Any property investor who is unable to claim depreciation on previously used plant and equipment due to these amendments will be able to claim a capital loss for the decline in value of the plant and equipment assets. This capital loss will only be able to offset a capital gain and if needed can be carried forward to offset future capital gains. A value that relates to the previously used depreciation assets will need to be established at the time of purchase. A decline in value will then need to be calculated for the assets so that a termination value can be determined at the time the property is sold. The difference between the value at the time of purchase and the termination value will be the capital loss which will reduce the owner’s CGT liability. How will the changes affect an investor’s cash return? 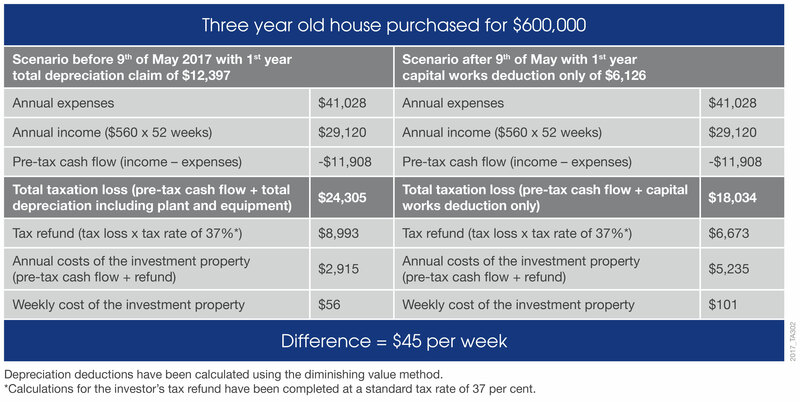 The following scenario compares the cash return an investor will receive for a three year old house purchased for $600,000 both before and after the proposed new measures. In the example, the owner receives a rental income of $560 per week or a total income of $29,120. Expenses for the property, such as interest, council rates, property management fees, insurance and repairs and maintenance total $41,028. In scenario one, the owner is able to claim a total depreciation claim of $12,397 for both capital works deductions and plant and equipment depreciation. Using depreciation, this investor will experience a weekly cost of $56 per week to hold the property. In the second scenario, as the owner exchanged contracts on the property after 7:30pm on the 9th of May 2017, they are only able to claim $6,126 in capital works deductions and will be unable to claim $6,271 in plant and equipment deductions. This reduced claim would result in the investors weekly cost of holding the investment property increasing from $56 to $101, a difference of $45 per week or $2,340 in the first full financial year. As you can see, the proposed changes will limit the depreciation deductions available to property investors, which will lead to a cash flow reduction each year. While we believe that generally the integrity measure has merit, the proposed changes go much further than what is necessary to deliver on the Government’s intention of stopping subsequent owners from claiming deductions in excess of an assets value. The approach proposed in the draft legislation treats residential property investors differently by extinguishing a property investor’s ability to claim a deductions based upon a transaction. We believe this is caused by gaps in current legislation around establishing a depreciable value for second-hand plant and equipment. BMT Tax Depreciation will be making a submission detailing this concern along with suggestions of alternative methods which will better resolve this integrity issue. To view the draft legislation and make a submission click here.